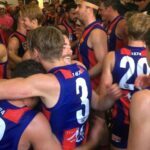 Port Melbourne will be entering this weekend’s VFL State Game bye with a 4-3 win/loss record after sneaking past a plucky North Ballarat Roosters outfit at Eureka Stadium on Saturday night. In a unique clash under lights on the newly resurfaced Eureka Stadium, the Borough seemed to take an eternity to become accustomed to the conditions and eventually had to pull out all stops to ensure they took the 4 points back down the Western Highway. As the 7:00pm bounce of the ball drew closer, it became apparent that both sides would also have to adjust to an ever-increasing wind blowing directly to the Creswick Road end of the ground. In the first quarter, it was the Roosters who had the advantage of kicking with that breeze, and their youthful enthusiasm around the contests seemed to catch the Borough off guard as they slammed through five goals-to-one to open up a handy early buffer. After commencing the game in the forward line following his three-goal last quarter cameo against Footscray, regular defender Brody Mihocek was again the hero in the second quarter as he kicked three more in the space of twenty minutes amongst the total of six for his side in the term; which had the scores deadlocked at the main interval. 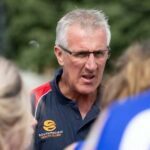 The third quarter was always going to prove pivotal in the context of the final result, with the Borough’s defensive unit expected to come under pressure as the Roosters again kicked with the wind. And so it proved, as North Ballarat worryingly were able to kick four goals within the first 11 minutes of the second half to again open up a 24-point buffer. From there though, Port lifted their defensive intensity and managed to halt the run of Roosters’ goals as they could only add one more to their tally for the quarter. A Josh Halsall soccer off the ground from the goal square also helped to minimise the deficit and settle nerves amongst the strong contingent of travelling Borough faithful. Even still, a three-quarter time margin of 22 points meant that a huge team effort would be needed to pull off a win in the last despite kicking with the aid of the breeze. Thankfully, Port showed plenty of fight and willingness to embrace the challenge. Almost within the blink of an eye, goals to Khan Haretuku, Josh Scipione, Mitch Golby, Halsall, Lucas Cook and Hugh Sandilands had given the Borough a 15-point lead at the 16-minute mark. However, just when it looked like the side would be able to pull away for a comfortable victory, the Roosters refused to lie down and kept the crowd on edge for the final 15 minutes. The final few passages of play were highlighted by a stunning goal from the boundary by impressive debutant Tom Hobbs, which finally put the result beyond doubt. As the siren rang across the Ballarat night sky, it was the Borough who had escaped with a 9-point victory, 15.7.97 to the Roosters’ 14.4.88; and the loyal fans in attendance were visibly relieved after surviving such a tight and tough battle. 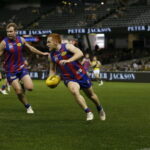 Midfielders Mack Rivett (21 possessions, 11 tackles), Toby Pinwill (21 possessions) and Golby (27 possessions, 13 tackles and a goal) were among those to stand out in the win, each winning plenty of the ball and providing a strong presence in the pressure of such a tight contest. Half-back flanker Damian Mascitti (24 possessions) won a lot of the ball and provided plenty of drive when the Borough made their ultimate bid for victory in the final term. Up forward, Mihocek’s 3 goals was matched by a return to form by livewire Scipione. Sandilands and youngster Halsall also contributed two goals apiece. On Sunday afternoon, the Development League side made it two Borough wins for the weekend as they led at every change to overcome Frankston by 37 points at Frankston Park. Nathan Batsanis and Leigh Osborne both made their returns from injury and impressed onlookers, as did Jason Williams, Jake McKenzie and Billy Hogan (3 goals). Both sides will now enjoy a weekend off as the VFL take on the SANFL in the State Game at the Adelaide Oval on Sunday. Following that, Port Melbourne will travel out to Casey Fields to take on the high-flying Casey Scorpions in Round 9 on Sunday 5th June. 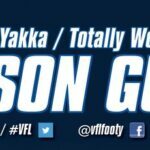 The club would like to take this opportunity to wish Khan Haretuku, Brody Mihocek and the rest of the VFL squad all the very best of luck for this Sunday’s clash with the SANFL. Goal Kickers: B. Mihocek 3, J. Scipione 3, H. Sandilands 2, J. Halsall 2, K. Haretuku 2, M. Golby, T. Hobbs, L. Cook. 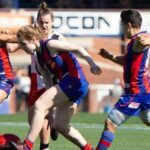 Best Players: M. Rivett, B. Mihocek, T. Pinwill, M. Golby, J. Scipione, G. Dickson. Goal Kickers: B. Hogan 3, B. Pearson 2, D. Iaccarino 2, S. Clarke 2, K. Dove 2, J. Williams, A. Mioni, D. Toman. Best Players: J. Williams, L. Osborne, J. McKenzie, N. Batsanis, B. Hogan, H. Hooper. Picture courtesy of Dylan Burns, The Courier (Ballarat).